I interviewed R.R. Virdi because he’s had a ton going on since the last time. 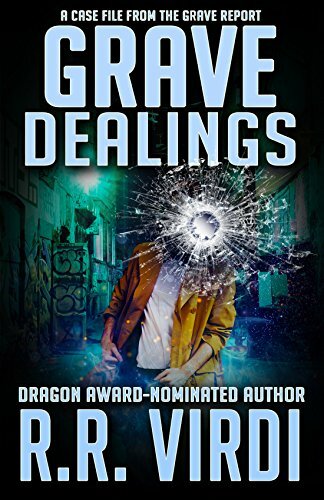 Here’s the shiny new cover of book three in The Grave Report series, Grave Dealings. Read about R.R. and then check out the description below. D.R.- Tell us about the coolest writing-related thing that’s happened to you in the last month. R.R.- New York Times best-selling author, Larry Correia, gave me these words about my writing: “His stuff’s badass.” Pretty encouraging stuff. D.R.- Have you ever been so inspired by a noun (person place or thing) that you finagled it into your story? R.R.- Oh yeah! Central Park during winter, under full snow, near night time. Ethereally gorgeous. Had to fit it into The Grave Report. So, it features into a nice scene in Grave Beginnings. I’d like to return to that and write it again somehow in one of my works. Truly beautiful–magical. D.R.- If you could talk to any single person, alive or dead, for research, who would it be and what would you discuss? R.R.- I’m a huge philosophy buff, just thinking/talking about life. I’d love to talk someone like Bruce Lee. He was a student of it, but also put his own into practice in interesting ways. Philosophy through motion, through his life, so much more. He taught, fought, believed certain things, and loved to enlighten. All of my works touch on some personal beliefs, philosophical views about the world, things in it, people, places, monsters, and good and bad. I think I’d learn loads. D.R.- What’s the coolest fan feedback you’ve gotten? R.R.- Fanart. I can’t pick one, but I’ve been blessed to receive all manner/styles of fanart. Truly a wondrous gift and pleasure. D.R.- If I only had time to read one of your works, which one should it be? R.R.- I’d honestly say, Dangerous Ways. I know it’s odd, what, with The Grave Report being a super success, earning rave reviews, award nominations and all, plus having more books out. But…there’s something about that one. I poured my heart and soul, like I do always, into that piece too…but, there was something else. Can’t put my finger on it. But in writing it, all the time it took on the draft, dreaming it up, it felt like there was more magic going into it. I can’t explain it. It just…still feels ethereal to me. Would love for more people to go check it out. I plan on writing the second soon enough. “His stuff is badass!” – New York Times bestselling author, Hugo-nominee, and two-time Dragon Award-winner, Larry Correia. You can follow R.R. Virdi on Facebook, Twitter, or sign up for his mailing list at his website. He’s also on Patreon, where you can support him for access to advance content and other cool stuff.